Nuclear medicine imaging uses small amounts of radioactive materials called radiotracers that are typically injected into the bloodstream, inhaled or swallowed. The radiotracer travels through the area being examined and gives off energy in the form of gamma rays which are detected by a special camera and a computer to create images of the inside of your body. 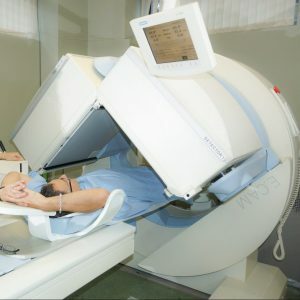 Nuclear medicine imaging provides unique information that often cannot be obtained using other imaging procedures and offers the potential to identify disease in its earliest stages.